In our company, we do fit-out that goes beyond details. It is an expansive complex of development works where we believe that a good interior isn't completed without its fit-out works. We assist our client with choosing the correct plan and inside fit-out that will fit their goal. We have painters, plasterers, mosaic tile layers, installers and numerous other expert staff with numerous long stretches of involvement. We believe that the premises specifically relies upon the nature of the fit-out works performed by an amazing team. 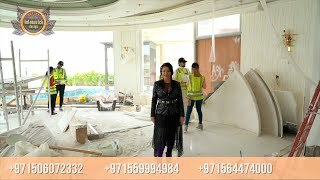 Luxury Antonovich Design gives a wide scope of fit-out works in Dubai, both inside and outside. Luxury Antonovich Design is a genuine expert in its art and we create fit-out work perfectly. We utilize the most recent equipment, which enables us to give assurance for the work that we perform. Luxury Antonovich Design is the perfect company for your inside arrangement needs as they do the best surrounding they can! We welcome a ton of floor space in the living zone. The room is amazing with lovely additional items, beautiful dividers, and luxurious furniture that help make extra stunning feel inside the area. Blue is a calming shading for use in living zones. A room stacked with character and large living for the perfect get-together. It also advances a calming, hotel-like feel. Perfect for gigantic get-togethers of relatives. Luxury Antonovich Design made the walls with marble that emphasizes warmth. To achieve a lovely look, our wonderful execution on the rankings reflects our inside plan achievements. With our arrangement centers and focuses, we connect with our property holders around the world to achieve this dream home in creative ways. A standout amongst the best is Luxury Antonovich Design. The absolute most prevalent fields that Luxury Antonovich Design is known for are interior designs. Luxury Antonovich Design works with the best people in the industry to create a front line style. Our approach to managing designs is a champion among the best. Luxury Antonovich Design is perceived as a company that offers world-class structure. Luxury Antonovich Design's amazing sense of style.